a) The machine uses fully balanced transmission technology and the components include 800VA transformer produced by Jungson, senior 296,000 microfarads filter capacitor from Japan, coupling capacitor (Japan, Denmark), 1295/C3264 Sanken power tube 10 pairs / per channel (Japan), push tube 15031 and 15030 (USA). b) The JungSon JA-2/JA100 Reference Power Ampflier is the flagship model in JungSon's Class-A amplifier fleet. c) The sonic excellence of the JA-2/JA-100 is also reflected on its marvelous dynamic performance as a wide range of signals transiting in and out from a dead-silent background without any unwanted lingering traces. 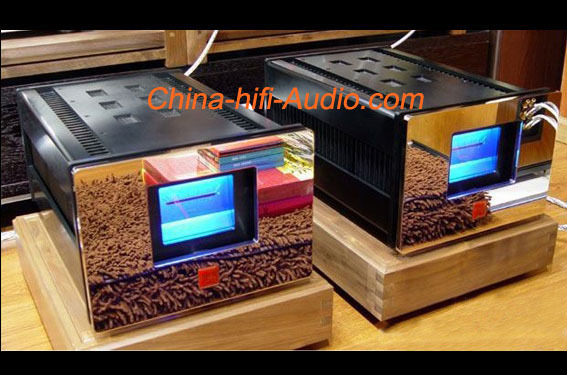 d) The JA-2/JA-100 has established itself in an unrivalled position among thousands of power amplifiers in today's Chinese market and been named as "the King of Hi Fi amplifiers in China at the moment" by the authoritative Hi Fi magazine Super AV in 2002 (Hong Kong, Vol.82, page 112).